The PCE-1000 portable hardness tester is ideal for testing the surface hardness of metallic surfaces quickly. In metallurgy, its very important to know the hardness of the materials being used and this device allows for the materials to be tested in the factory. The hardness tester brings together the parameters of Rockwell B & C, Vickers HV, Brinell HB, Shore HS and Leeb HL. 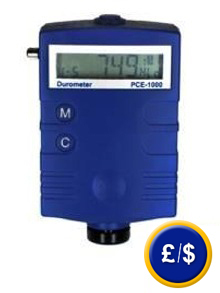 Thanks to its portability, this hardness meter is very useful in production, quality control and technical service. Its compact design and rechargeable battery makes this a very easy device to use. 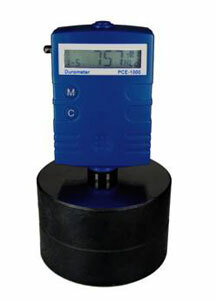 The PCE-1000 hardness tester can be used in any position but doesn't have the capability to transfer or store data. Here you will find a hardness tester with an RS-232 and optional software for data transmission. The Leeb measurement method was used for the first time in 1978. 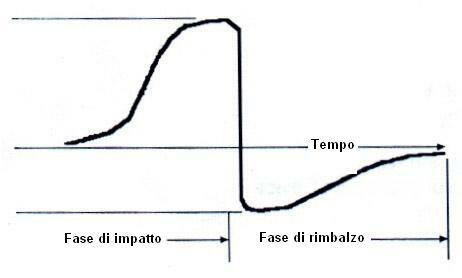 It is defined as the rebound velocity of the hammer divided by the impact velocity times 1000. The higher the value, the higher the hardness of the material being measured. For a specific group of materials, such as steel and aluminium, the Leeb hardness test establishes a direct relation to the materials hardness conditions. This device includes the conversion curves for HL hardness and for other standard static hardnesses such as HB, HV and HRC with the possibility to convert Leeb into other values and display these. Therefore, this is a device for professionals to be used for shipping and receiving, production or research and development. The PCE-1000 hardness tester comes in a hard case which also contains a test block, charger, 9V rechargeable battery and elestic pin. This solid case guarantees the safety of the device and its components. This device is also completely safe for the user to operate. The procedure for measurement uses the difference between the rebound velocity and the impact velocity. The instrument uses a spring loaded hammer which is struck against the surface of a piece of metal. This proceedure was developed by Mr. Leeb, which is where the name comes from for the hardness unit, the Leeb (HL). Steel, cold casting, stainless steel, cast iron, aluminium, brass, bronze, copper and forged metals. - Work surfaces of less than 2kg must be attached with an acompanying board. Here you will see an outline of the temporal division of the different phases of measurement when using the PCE 1000 hardness tester. The impact is always made with the same velocity against the body of material being measured. The energy produced by the rebound differs across a wide range of materials. 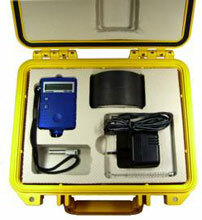 PCE-1000 hardness tester, elastic pin, test block, charger, cleaning brush, case and user's manual.